Posted on April 13, 2014 by Michele D.
I spent the day in a cooking frenzy and thanks to me, my hubbie spent the day in an errand-running frenzy. I kept coming across ingredients I’d forgotten to buy and also thinking of things we needed that weren’t included in my original Passover plan. At the end of the day, I’d completed 6 of the 9 items, plus 1 bonus cake so I’m counting that as a win since I’ve still got tomorrow to finish up numbers 7, 8 and 9. Tri Color Gefilte Fish from Rosh Hashanah 2012 is always a big hit. It’s a bit time-consuming to make and you need to read the entire recipe before starting or else you’ll end up like me today … somehow skipping over the eggs, salt and pepper that needed to be added to the gefilte fish base and then having to figure out how to get them in after the fact. Keeping my fingers crossed that this dish turns out OK this year : ) I also usually make some kind of a horseradish-based sauce to go with this fish. Kosher Meat and Potato Roll or as it’s known in my house, the Meat Log. 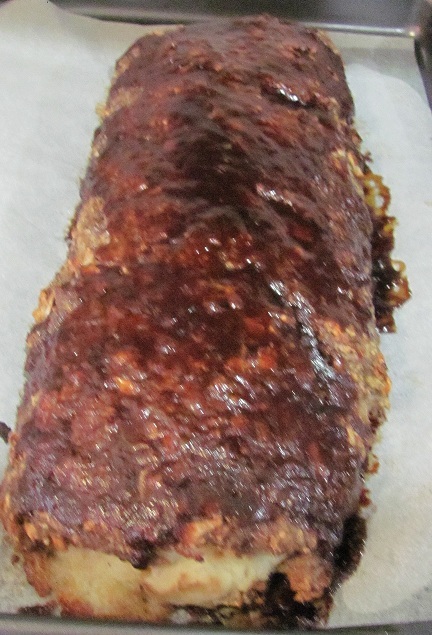 It’s like your Mom’s old-fashioned meatloaf with a hidden surprise inside of mashed potatoes. 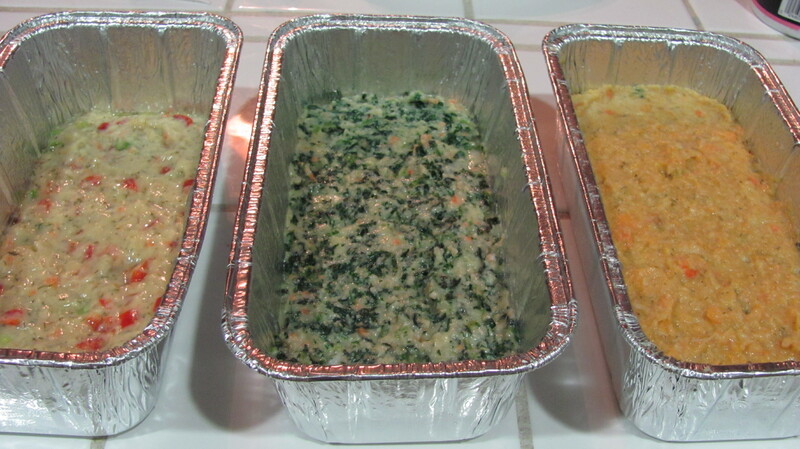 We joke about this dish often, but it’s always a hit and it’s always gone at the end of the Seder. Delicious and somewhat easy to make. Sweet and Sour Meatballs from Susie Fishbein’s Passover by Design cookbook, page 35. I originally found this meatball recipe in Susie’s cookbook for kids, where there are 2 different kinds of meatballs. My family loves both so the Sweet and Sour version is an easy, quick crowd-pleaser for Passover. 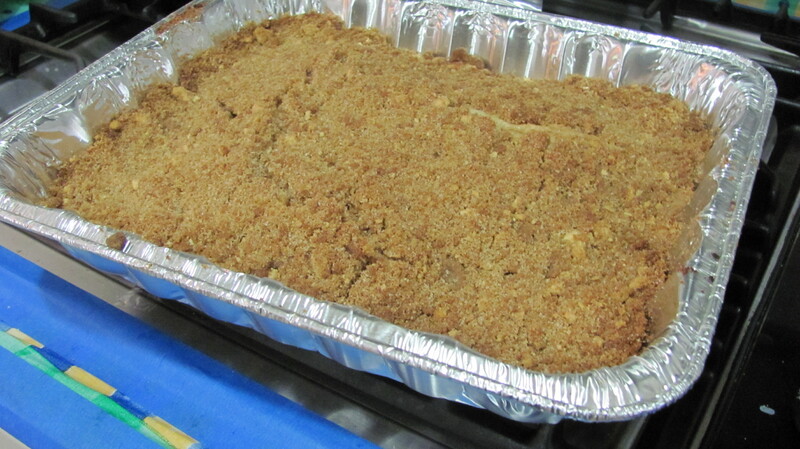 A hidden Passover Dessert Gem – the Crumb Cake from Susie Fishbein’s Passover Cookbook page 248. This cake looks like dry sand but taste like moist yummy apples, even though there’s not a single apple in it. I couldn’t believe how delicious it turned out last Passover so it’s making a repeat appearance this year. A small amount of effort and ingredients produces an amazing dessert. Teriyaki Chicken, also from Susie Fishbein’s Passover by Design cookbook, page 124. I have a bit of a love, hate relationship with this recipe. The photo in the cookbook makes the sauce look very dark brown and quite beautiful. My sauce never seems to get that dark. It’s more of a tan color and never as sticky as described in the book. I’m sure it’s user error on my part, and the chicken is still quite tasty, which is why I keep making it but I do wish I knew the secret to the dark brown, sticky consistency. Slow Roasted Chicken, page 115 of the same cookbook. This recipe is a new one for us. My husband usually makes a slow-roasted chicken using the rotisserie tool on our grill, but since we can’t use it for Passover, I decided to give this oven version a try. I’ll let you know how it tastes after our first Seder. Has anyone made this chicken before? Purple Cabbage Salad, page 82 of the same cookbook. I make this salad for almost every holiday and when we’re having company for Shabbat. It’s definitely loved and it holds up well over a few days if there are left-overs. What are you cooking for Passover? Do you have favorite dishes you make every year? Happy Passover and Happy Kosher Treif Cooking! I’m about to start a Passover cooking frenzy and realized I never got around to blogging about our Mishloach Manot project, which was both fun and exhausting. My 7 year-old-daughter announced early on that she wanted our gift baskets to include chocolate covered strawberries and the complete package came together from there. I came up with the idea to use flower pots as our “basket” and my sister-in-law Rosie, suggested we put the strawberries on sticks so they looked like actual flowers. I loved the plan so I went to work several weeks in advance (thank goodness) gathering supplies. I borrowed the Chocolate Dipped Strawberries recipe from The Shiksa in the Kitchen with one small addition. I added about a tablespoon of Crisco to the chocolate to aid in the melting process. I also broke down and bought an inexpensive double-boiler from Bed, Bath and Beyond. Yes, I know it’s nuts that I didn’t own one, but I’ve never had to melt gallons of chocolate before so a new pan was definitely needed. Next, I found cute, colorful, plastic flower pots at the Dollar Store, along with Easter grass, green napkins, and the green blocks of styrofoam used for flower arrangements. I cut the styrofoam blocks into pieces small enough to fit into the bottom of each flower pot and used a hot glue gun to “attach” the sytrofoam to the bottom of the pot. Next, I used hot glue to “attach” the green napkin to the center of the Styrofoam block so that the edges of the napkin “flowered” out to cover and hide the Styrofoam. 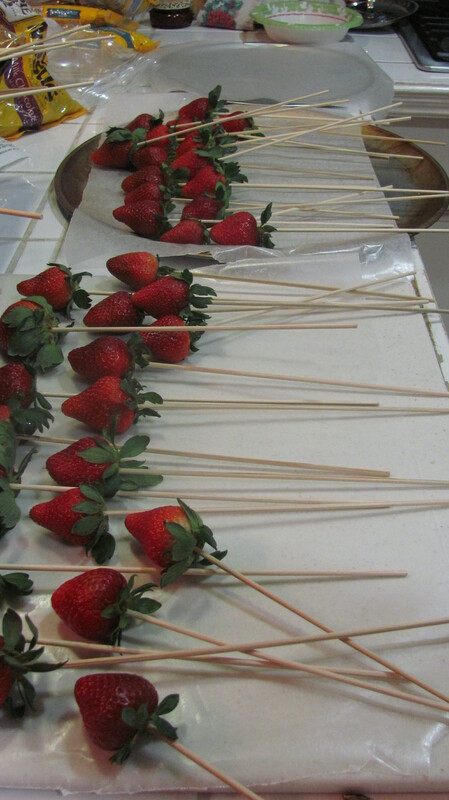 The night before Purim, I washed 100 strawberries and added them to skewer sticks (purchased in the grilling/outdoor cooking section at Walmart). I melted a lot of chocolate using my double-broiler, dipped each strawberry into the chocolate and laid on a piece of parchment paper to dry. 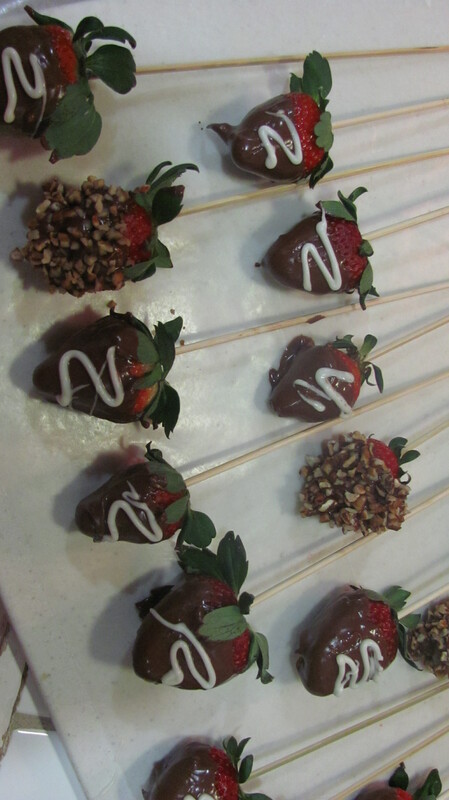 I also dipped a few of the strawberries into chopped pecans while the chocolate was still soft. After the chocolate had hardened, I melted white chocolate and added to a Wilton cake decorating bag with a small round tip to add the swirl design. Next, all strawberries went into my refrigerator to chill and stay fresh overnight. Adding 3 strawberries to each flower pot by pushing the sticks through the napkin and into the styrofoam. Covering the 3 strawberries with clear plastic bags purchased at Walmart (in the party section, used for party favor bags). 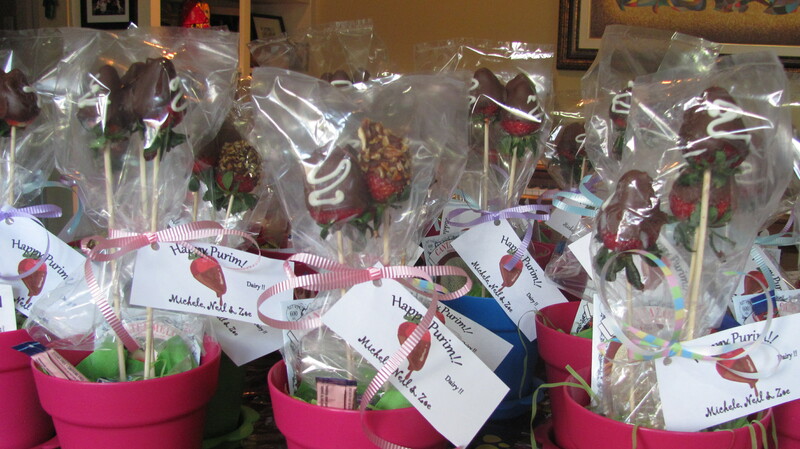 Tying the bag around each set of strawberries with ribbon and the cute tag my hubbie made. 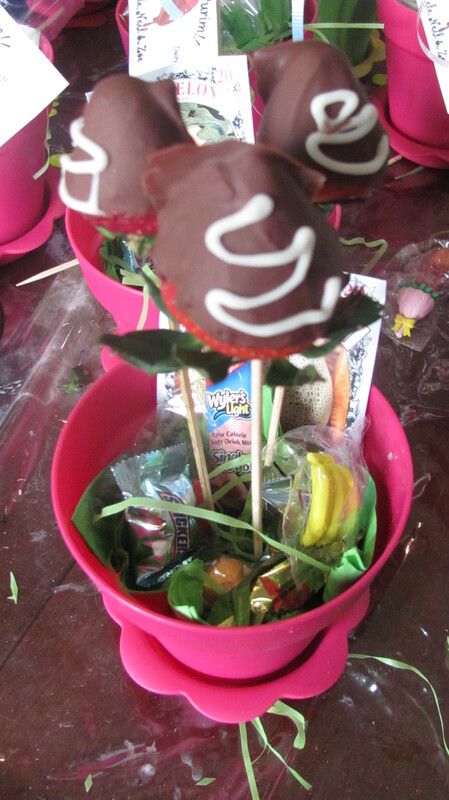 My plan was for the Mishloach to be a “Fruits of the Vine” theme but in the end, everyone was too tired to come up with a cute poem so we ended up with a simple “Happy Purim” with a picture of a chocolate dipped strawberry. Maybe next year we should start with the design of the tag first! I’ll admit that delivery was no piece of cake. Fortunately, it was a cool day in Texas so nothing melted but a few of the skewers did poke through the top of some strawberries so I had to make some adjustments before deliver. And we had enough strawberries left over to serve at a Purim dinner that evening. All in all, it was a fun process and no treif was involved! How about you? 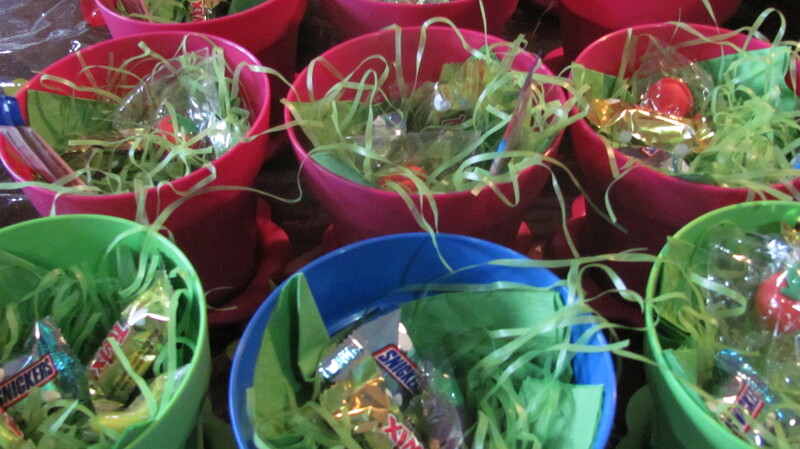 What was in your Mishloach Manot basket?